Caribbean Lifestyle Media-Adidja Palmer has been the talk of Dancehall for the entire 2009. It is no surprise to learn from Ms Raine, Inc (publicist) that Vybz Kartel has been nominated for multiple Excellence in Music and Entertainment (EME) Awards. 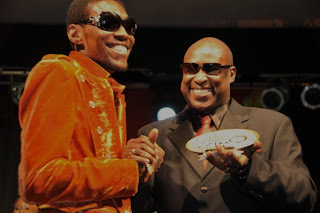 Vybz who was DJ and Song Writer/Lyricist of the year in 2008 is nominated for DJ of the Year -Male;Song of the Year - Dancehall (2 nominations for "Completely" and "Mind Pon Mi Money");Recording Artist of the Year; Song Writer/Lyricist of the Year;Collaboration of the Year - Dancehall (2 nominations for "Completely" featuring Indu, and "Versatility" featuring Indu) ; International Artist of the Year (for the single "Romping Shop" featuring Spice) . The promising roster for Kartel's Adidjahiem Records include Jah Vinci, Blak Ryno, Gaza Kim, and Merital all will have the fans waiting to hear more coming from this camp. Vinci, who had a hit in 2009, titled 'watch your friends' has the ability to reach beyond Portmore and into the overseas market. Ryno and Vinci have both score an EME nominated in the Breakthrough artiste of the Year and Most Improved Artiste category. Ainsley 'Notnice' Morris in house producer for the empire was also nominated in the category of "Producer of the Year-Dancehall".